People are designed to function within the natural landscape, and as our natural landscape further deteriorates, designers are using green-roof technology to re-define urban development as ecologically sustainable. Green roofs reinstate some of the landscape features that originally made life habitable on land, but were torn down to make way for skyscrapers and apartment buildings. A green roof, or an engineered vegetative layer planted directly into the roof over concrete, tile, etc, comes in many forms, but in the end, each has the same effect: renewing the visual and environmental connection to ecological balance. 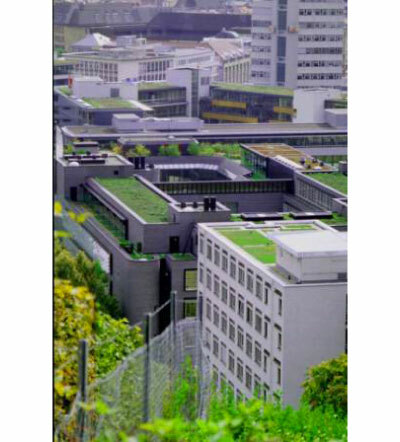 Prominent in Europe and making headway in the US, green roofs re-introduce biological diversity into our cities, support architectural structure, and reduce the psychological stress and environmental impact of development. The design challenge of green roof is to combine mechanics with aesthetics and create an urban geography that fulfils its visual appeal and environmental benefits all at once. All systems have their design advantage based on individual architecture, but the basic green roof forms are: extensive, which are self-regenerative, low maintenance, visual gardens; and intensive, which have more of a functional basis, heavier, with more vegetative capabilities. 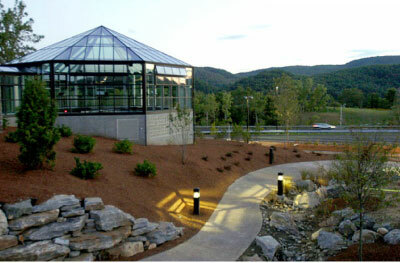 All green roofs consist of a multi-ply water-proofing layer, drainage, filter fabric, growing media, and plants. The design solution is surprisingly simple and low tech, according to Israeli designer Tal Marco’s brilliant Banana Leaf packaging alternative featured in Designboom’s “Dining in 2015” design competition. The banana leaf wrap is a renewable package that utilizes ancient food preserving techniques from India and South East Asia, and innovative design to address modern environmental waste issues. Marco is a designer that sees sustainable potential in the present. Instead of making more stuff, he looks to a by-product trashed in the Western world during agricultural production. He takes the banana leaf’s already waxy, flexible surface and puts it to new use in the tradition of up-cycling. According to Marco, the design uses no glue, and is adaptable to any product because the banana leaves are die-cut for easy opening along their natural edges. Marco’s banana leaf package design is a sustainable solution at it’s best, employing the principles of up-cycling existing materials and recycling cultural wisdom. Ecological design technology is based on the idea that manmade “machines” can be harnessed to mimic biological systems, giving us the power to restore environmental contaminants and neutralize the build-up of waste on the planet. John Todd, a marine-biologist, inventor, and designer, is using eco-technology to address the global wastewater crisis. Todd applies principles of bio-mimicry to create Eco-Machines, which are networks of biological systems built to strategically transform industrial sewage into usable water. Eco-Machines are custom built for size requirements, but they all look like a series of connected fish tanks, each tank a separate treatment zone utilizing anaerobic, flow-equalization, anoxic, and aerobic processes. Water flows through the tanks and sifts lastly through an effluent filter, such as a constructed wetland or fluidized bed, to catch leftover solids. All of this is accomplished without the use of chemical-based inputs that are used in sewage treatment plants, which eject chemically imbalanced water back into water streams, starving our rivers of oxygen with unwanted algal blooms. Living Machines are built to recreate the complexity of ecosystem relationships, which are fostered between microscopic algae, bacteria, protozoa, fungi, zooplankton, minerals, snails, fishes, and plants. The home is where a culture begins, and the members of the Alfredo Santa Cruz family are re-defining our culture/environment relationship by building homes from unlikely materials. 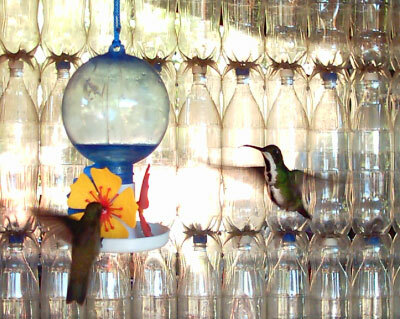 The Casa De Botellas was created by the Santa Cruz family in Puerto Iguazu, Argentina, as a tool for promoting ecological and social responsibility. Although they are not architects or engineers, the Alfredo Santa Cruz family successfully designed their portable structures to be accessible, simple, and creative down to the last detail. The structures of the house and every piece of furniture inside are constructed entirely from used plastic. PET remains intact for 300 years, which is longer than cement, and more durable. This is an ingenious re-use that turns the hazard of slow decomposition into an asset. The walls are made from 1,200 PET plastic bottles, which support a 1,300-piece Tetra Pack roof holding 140-piece CD jewel-case doors and windows that surround plastic-bottle couches and beds. A self-invented casting technology keeps the bottles fused together without obstructing the visual symmetry. Creating environmental solutions from the ground up, the Cruz family provides free home building courses to address both trash and housing scarcity in Latin American countries, “realities that nobody can hide”. In the 1800s, Brooklyn and Queens had the highest density of agricultural land in New York City. Today, the city landscape has changed, with total unused land of about 10,000 acres, all broken up into thousands of vacant lots, private backyards, and underutilized squares. Space in New York City is a highly valuable commodity. Walking down any city street, one can see urban dwellers creatively squeezing every inch out of the precious space they occupy. To BK Farmyards, a Brooklyn-based urban farming business, these structural limitations are the seedlings for a radical, community-based farming solution to food-sustainability issues. Contrary to our current chemical and land intensive agri-business model, it doesn’t take a lot of land to feed people — 250 square feet can feed 4-5 people for 6 months, according to BK Farmyards owner Stacey Murphy. 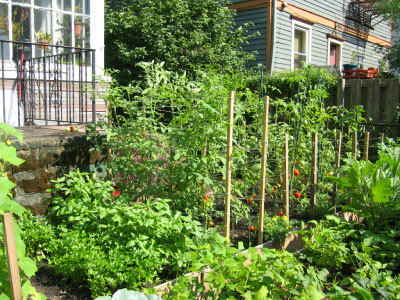 BK Farmyards converts underutilized urban land, from private backyards to traffic circles, into edible gardens that grow crops, culture, and community. Their vision is large social change through use of tiny spaces: transforming the design and function of small plots into a decentralized, agricultural network connecting food producers, landowners, and consumers.